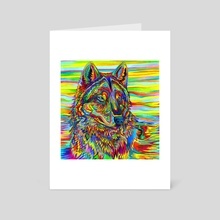 A psychedelic rainbow wolf, a different kind of wolf portrait! 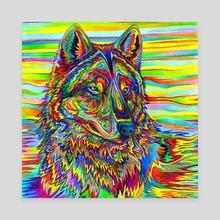 Psychedelic wolf done in rainbow colors. This vibrant and colorful wolf portrait is a fresh take on a common subject. 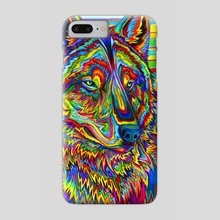 Highly saturated rainbow colors create different tones and shadows in the fur, then fade out on the right to abstract wavy lines. Rebecca Wang is a traditional artist who works primarily with acrylic paints, pastels, and colored pencils to create vibrant and energetic animal portraits. 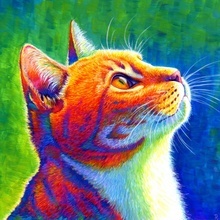 She is most well known for her colorful animal paintings and colorful and expressive pet portraits. Her portfolio includes dog art, wolves, tigers, birds, and reptiles, in addition to mythological creatures dragons and phoenix birds. She uses bright rainbow colors and bold brush strokes to create energy and movement in her artwork.